World War II Memorial. 1941 . 1945—. 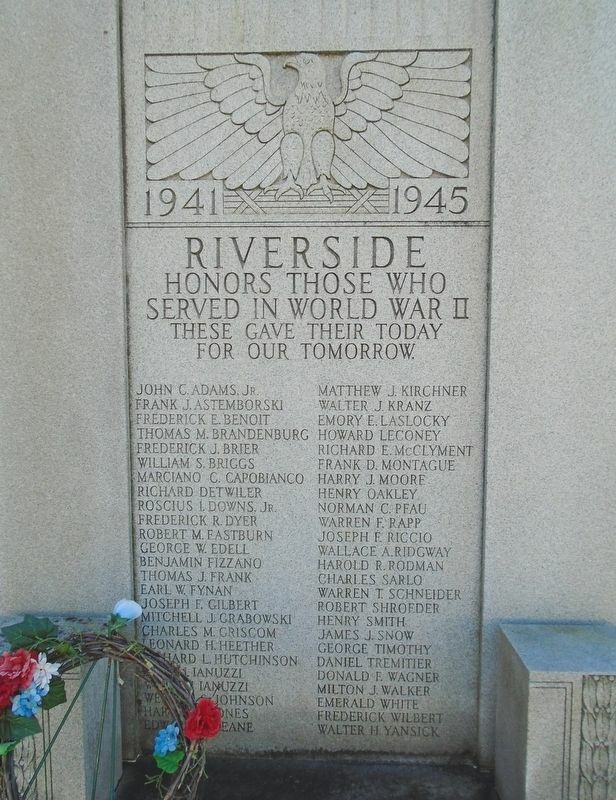 Riverside honors those who served in World War II These gave their today for our tomorrow. Location. 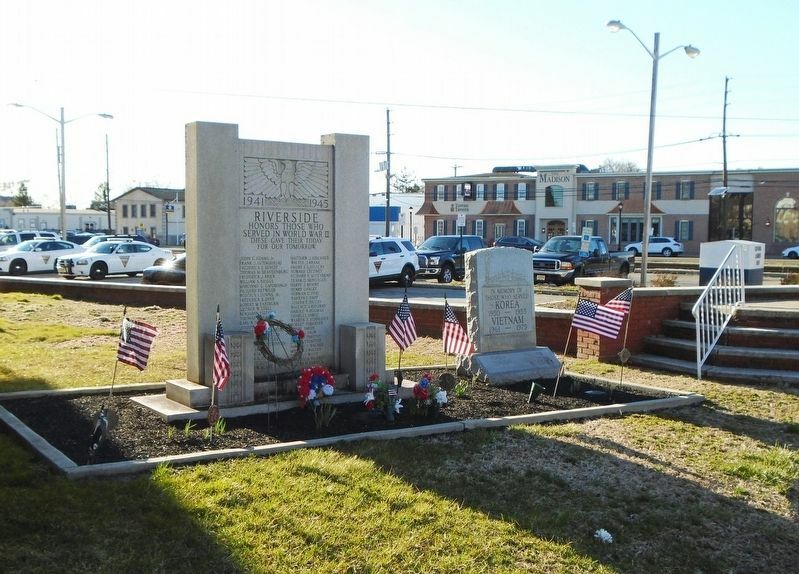 40° 2.291′ N, 74° 57.591′ W. Marker is in Riverside, New Jersey, in Burlington County. Marker is on Pavilion Avenue south of Franklin Street, on the right when traveling south. Touch for map. Memorial is on the municipal court building grounds. Marker is at or near this postal address: 1 West Scott Street, Riverside NJ 08075, United States of America. Touch for directions. Other nearby markers. At least 8 other markers are within walking distance of this marker. Korea and Vietnam Wars Memorial (here, next to this marker); World War I Memorial (a few steps from this marker); Keystone Watchcase Clock Tower Restoration and Lighting (about 400 feet away, measured in a direct line); Delanco's Tribute to Those Who Lost Their Lives in the Second World War 1941 - 1945 (approx. half a mile away); Honor Roll (approx. half a mile away); To Those Who Made the Supreme Sacrifice - Korea - Vietnam (approx. half a mile away); Cambridge School (approx. 0.9 miles away); "Babe" Ruth (approx. one mile away). Touch for a list and map of all markers in Riverside. Credits. This page was last revised on March 25, 2019. This page originally submitted on March 25, 2019, by William Fischer, Jr. of Scranton, Pennsylvania. This page has been viewed 38 times since then. Photos: 1, 2. submitted on March 25, 2019, by William Fischer, Jr. of Scranton, Pennsylvania.